Home > Commercial Lending > Business loans have fallen after several years of growth. Business loans have fallen after several years of growth. Business loans have flattened out after several years of growth. Is this is bad sign for the economy, or just normal fluctuation? Nobody should be worried by this being a sign of forthcoming recession, but I am concerned that it may mean greater bank tightening of credit terms. The chart shows what bankers call “commercial and industrial loans.” These are business loans not related to commercial real estate. It’s a little deceptive, because some banks use real estate as collateral for a loan that is not related to commercial real estate construction. However, this is a pretty good gauge of lending to businesses small and large. On this topic Jim Picerno at Capital Spectator makes a point: “History suggests that business and commercial loans are a lagging indicator for monitoring recession risk.” That is true, but it deepens the mystery: given the economy has grown over the past seven years, why aren’t business loans still expanding? Three business activities trigger the need for bank credit: capital spending, inventories and accounts receivable. Assets spending certainly dropped exponentially last year, partially from the decline in oil and oil drilling, which lessen the need for pipe and motors and related equipment. The other portion was simply pessimism on the part of business leaders. Corporate executives were willing to spend money to reduce operational costs, but not to increase their business’s total capacity. They saw the benefit of reducing their expenditures on energy and labor, but they did not see the necessity for more production capacity. This is for both the production and service sector. Business capital spending seems to be turning up now, slowly, though it is limited by uncertainty related to new policies from the Trump administration. This somewhat explains the flattening out of business loans. The second trigger for business loans is inventories. Companies have been increasing their inventories by about 2% to 3%, less than the growth of the overall economy. As a result, inventory-sales ratios for manufacturers, retailers and wholesalers have dropped in the past year. That’s further explanation of poor business lending. Finally, business accounts receivable trigger borrowing. Account receivables have been growing at about the pace of the overall economy, five percent in the past four quarters. That would typically imply some growth in the business loan demand. However, account receivable growth had been lower last year and in 2015. Many businesses with slow-growing receivables can accommodate that increase through internally-generated funds. 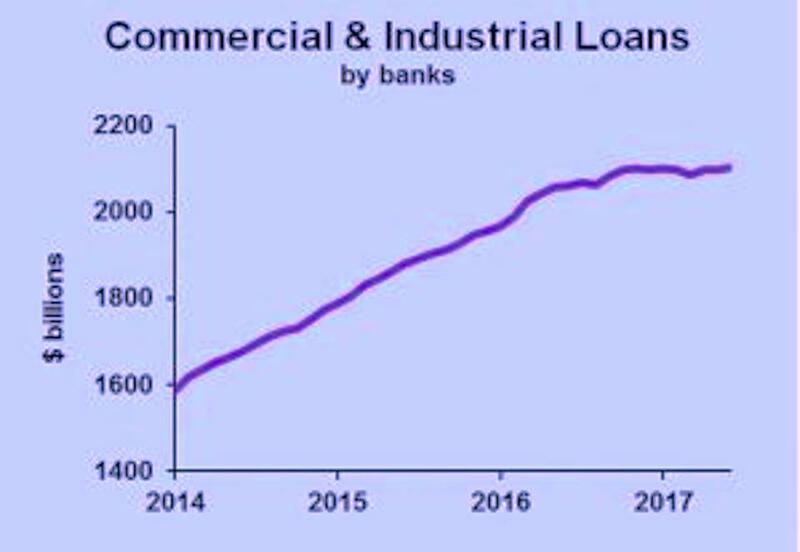 In sum, the total demand for business loans seems to be soft: weak capital spending, low inventory growth and moderate accounts receivable growth. The possibility that worries me is banks tightening their lending standards—that could have an economic impact. The latest survey of bank lending officers, though, shows a hint of easing rather than tightening. This survey is “low fidelity,” but it does not point toward credit being harder to get. So let’s not worry about bank lending as a negative indicator of the future, but a tepid indicator of the past path of the economy.